Teen protagonist Meg Murry is distraught because her father, experimenting with time travel and the fifth dimension, has mysteriously disappeared. Now the time has come for Meg, her friend Calvin O’Keefe, and her young brother, Charles Wallace, to rescue him. They must overcome the forces of evil, but they discover that intelligence is no match for the brainwashing power of IT. 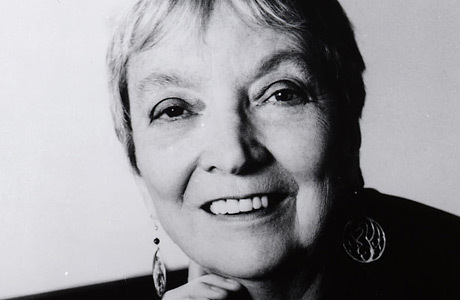 Like JK Rowling in her more contemporary “Harry Potter” series, Madeleine L’Engle focused on the power of love to overcome darkness. Beloved little brother Charles Wallace has been been mentally and emotionally “hijacked”, and his sister cannot reach him with reason. This novel is not a cold science fiction adventure, but a warm-hearted call to familial connection set in a fascinating mixed-up setting of real life and intergalactic fantasy. 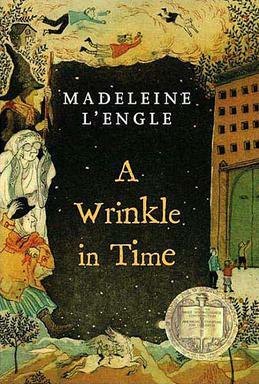 Did you know that A Wrinkle in Time is the first in a series of five books? Recently, I went back and re-read the first three and then, read the fourth and fifth for the first time, since I missed them as a young adult reader. (A Wrinkle in Time Quintet titles in order of publication: A Wrinkle in Time, A Wind in the Door, A Swiftly Tilting Planet, Many Waters, An Acceptable Time). I would like to add a brief comment that the movie, “A Wrinkle in Time”, released in 2003, although not exactly bad, certainly doesn’t have the emotional impact of the book. 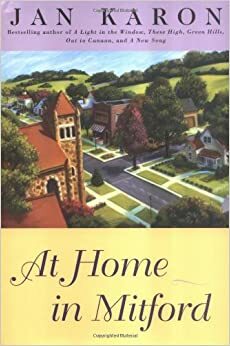 Many years ago, I saw Ms. L’Engle in person when she was awarded an honorary degree at my alma mater, Wheaton College, Illinois. Her rich and interesting life included a childhood in New York City, time in France at boarding school, living with her wealthy grandfather in South Carolina, acting, supporting her actor husband, Hugh Franklin, in Manhattan’s theatre circles, and running a general store in rural Connecticut. Now I am on to Meet the Austins, the first of the five Austin Chronicles, one of which received the Newbery Honor Medal (A Ring of Endless Light). I welcome your comments about Madeliene L’Engle or any of her novels. 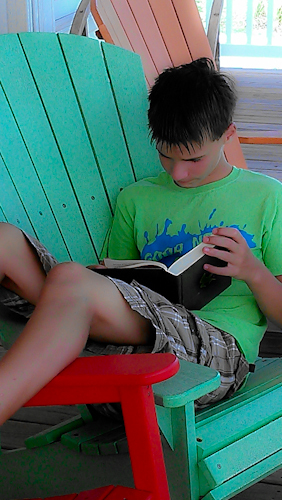 Pineneedles and Papertrails Propaganda moment: Do you want your kids to be readers? According to Patrick Jones, author of Connecting with Reluctant Teen Readers, parents must model reading behavior and allow kids to see that parents “waste time” in nonessential pleasure reading. This helps the child to allow himself the same luxury. I think I must have English vocabulary on my mind since my children are in the SAT taking years. We have many resources to augment our own vocabularies and those of our kids. 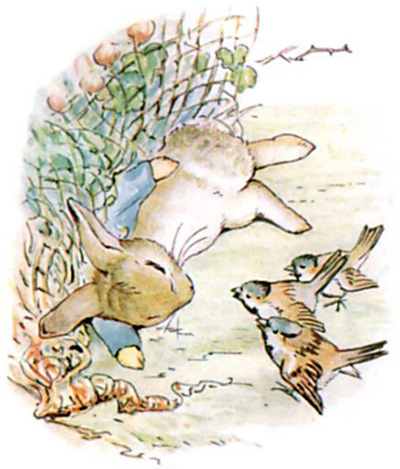 One such treasure trove is the work of Beatrix Potter. 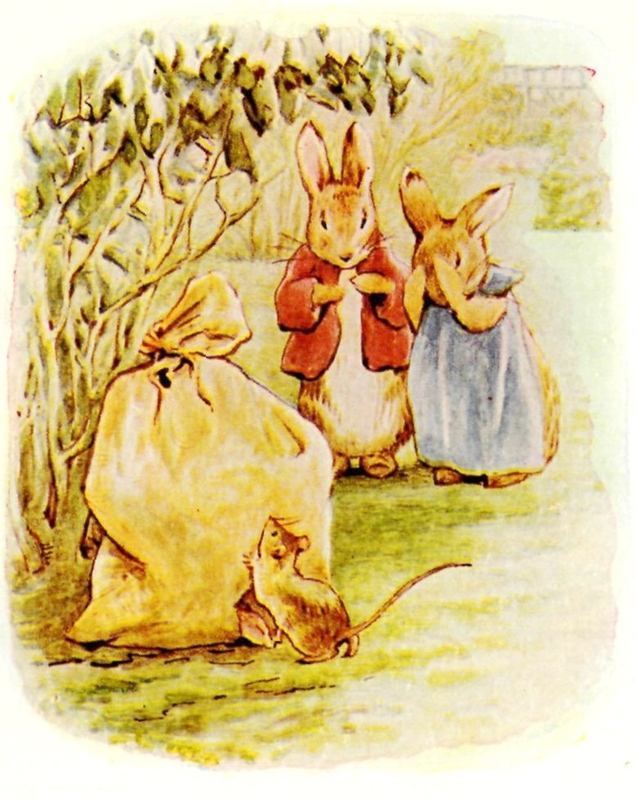 Over one hundred years ago, an English gentlewoman named Beatrix Potter pioneered in the field of children’s literature as both an artist and storyteller. 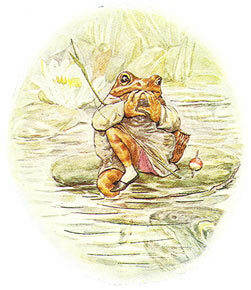 Miss Potter brought animal characters to life with exquisitely detailed watercolor illustrations that gave them unique anthropomorphic personalities and quaint, creative little outfits. Her stories pulse with gentle humor, vivid word choices, and complex plots, all of which are elements of children’s literature that we still need to treasure and emulate today. Our children and children’s children will benefit from each tale with its moral lesson and rich English vocabulary. I chose my five favorites and furnish an illustration, quote, and moral lesson for each. #1 The Tale of Peter Rabbit (published by Frederick Warne in 1902) – Peter disobeys his mother and ventures into Mr. McGregor’s garden to filch vegetables. The suspenseful chase through the garden patch is designed to strike terror into the heart of the child reader, but the intensity is mellowed by the help Peter receives from other animals, as well as his eventual escape. Moral lesson: Listen to those wiser than we are about danger. Disobedience has consequences. #2 The Tale of Jeremy Fisher (1906) – Jeremy Fisher the frog faces danger after he punts out on his lily pad boat to fish in his pond for minnows to offer to his dinner guests. A predatory trout swallows him whole but spits him out again after tasting his macintosh. Moral lesson: Dangers lurk, but we are often spared. Be careful when taking risks, think things through, and be grateful for the safety of home. #3 The Tale of Mrs. Tittlemouse (1910) – Mrs. Tittlemouse keeps an exceptionally tidy house as a result of her diligent, slightly obsessive effort. Her cleaning day is disrupted by several uninvited guests who dirty her house and cause her distress. After she shoos them out, the little mouse creates an environment in which to offer hospitality on her own terms, treating even her most impolite intruder with kindness. Particular (adj. ): having very definite opinions about what is good or acceptable Moral lesson: Having boundaries in one’s personal space and with belongings is very important, yet one can set boundaries without being harsh or unkind. 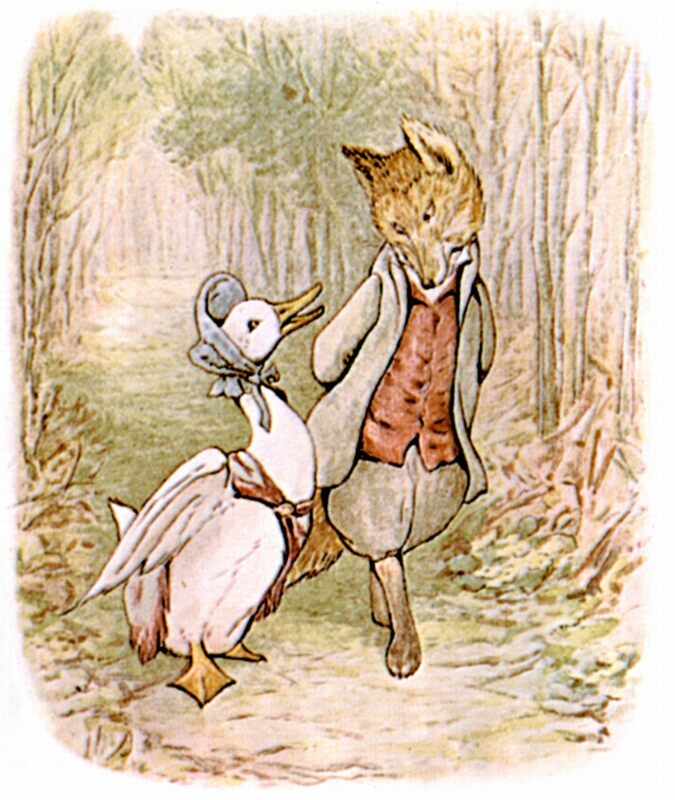 #4 The Tale of Jemima Puddle-Duck (1908) – Jemima Puddle duck is very naive and foolishly trusts the “foxy gentleman” who offers to help her achieve her heart’s desire to lay and hatch her own eggs. (The farmer keeps taking them away.) Jemima even allows the gentlemen with the whiskers to arrange a duck feather bed in his shed as her nest. Simpleton (n.): a person lacking in common sense Moral lesson: Choose carefully who to trust and pay attention to warning signs of untrustworthiness in the behavior of others. #5 The Tale of the Flopsy Bunnies (1909) – Peter Rabbit’s cousin, Benjamin Bunny, grows into an irresponsible adult and starts a large family he cannot support. Benjamin takes his hungry children to Mr. McGregor’s rubbish heap to eat a charity meal of old vegetables. After the father and children fall asleep, Mr. McGregor discovers them and captures them to give to his wife as the ingredients for a rabbit pie. With the help of Mrs. Tittlemouse, they are rescued. Moral lesson: Being sensible about money and planning for the future have great value because irresponsibility has clear negative consequences. However, we often have second chances and the help of others even after we have made poor choices. Did you receive an education from author Beatrix Potter in both imagination and English turns of phrase? I contend they are not out-dated, even though they may be old-fashioned. Let’s enjoy these timeless tales and pass them on to the next generation. I welcome your comments about your favorite Beatrix Potter stories and the lessons you see embedded in them. I recently discovered Apply Dapply’s Nursery Rhymes and Cecily Parsley’s Nursery Rhymes, two little volumes of charming poems. Movie Moment: I enjoyed the 2006 film, Miss Potter (PG), starring Renée Zellweger and Ewan McGregor about the author’s personal and professional life. Her love of the Lake District in England led to land conservation efforts that have preserved thousands of acres. 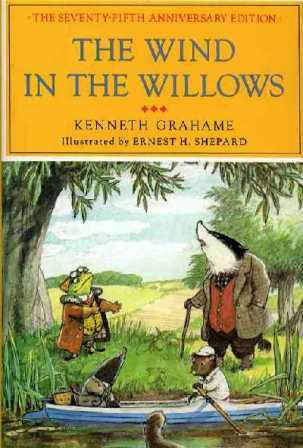 All of Beatrix Potter’s cherished animal friends still have their holes, stream banks, forests, and meadows to inhabit. A valuable aspect of the award is the honor it gives librarians, recognizing their life work to serve children’s reading interests. The panel of judges is made up of children’s librarians from pubic and private schools (members of the American Library Association). They choose the most distinguished American children’s book published the previous year. Although only a single book wins each year, several runners-up, listed as “Newberry Honor Books”, receive high marks and embossed seals on their covers as well. The focus of the award – “original and creative work” – highlights two values I personally esteem in literature. Writers and book publishers inundate children with copycat stories that get churned out in an attempt to follow the popularity flow. Movie producers often pursue the same “follow the leader” strategy to insure high box office sales in the film medium. In contrast, the Newbery Medal offers originality. 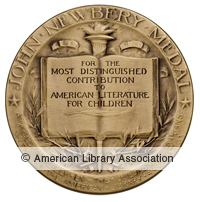 The first winner of the Newbery Medal was a history book, The Story of Mankind by Hendrik Willem van Loon. Next up was the whimsical fantasy,The Voyages of Doctor Dolittle by Hugh Lofting that won in 1923. Two stories which are more current and accessible due to recent book-to-movie efforts are the 1999 Winner: Holes by Louis Sachar and the 2004 Winner: The Tale of Despereaux: Being the Story of a Mouse, a Princess, Some Soup, and a Spool of Thread by Kate DiCamillo. 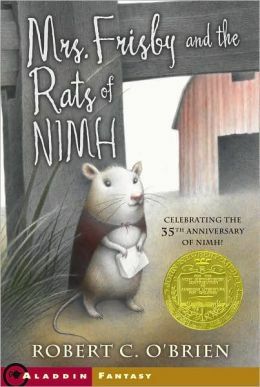 I recently re-read the 1972 Newbery winner, Mrs. Frisby and the Rats of NIHM by Robert C. O’Brien. This fantasy tale brings the reader into the lives of lab rats who escape their scientist captors and seek to establish their own society, one built upon self-reliance. The central tenet of their Great “Plan” is to live without stealing, unlike their rat ancestors. Mild-mannered Mrs. Frisby, the widow of lab mouse, Jonathan Frisby, steers her difficult course by the compass of familial love and finds unlikely allies in the rats of NIHM. Mr. O’Brien wove a fantasy story that charms more than it scares the young reader. 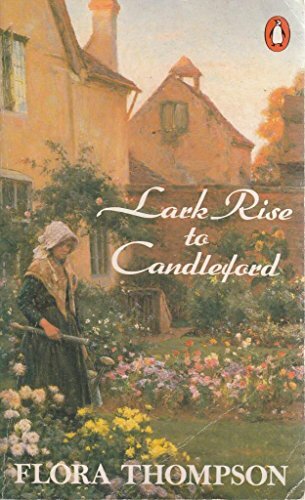 The author died only a few years after the publication of Mrs. Frisby, which makes me wonder what more he would have written given the opportunity. The ending of the book left me with several questions: What happened to the rats of NIMH; did they make a success of their new home in Thorn Valley? 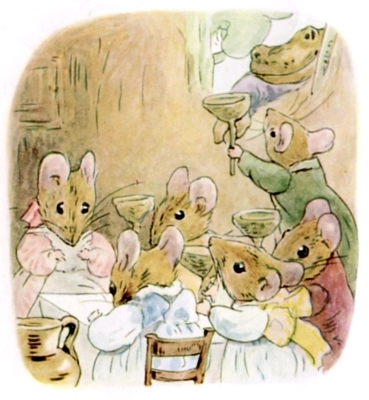 Did the Frisby mouse children grow up to do great exploits like their heroic father? As I researched the Newbery Award for this blog post, I read the list of 92 winners out loud to my teen daughters and was chagrined to find that they only recognized 10% of the books on the list. I myself have missed out on numerous titles since I only read the Newbery books that were published when I was a child and then later those winners promoted on homeschool curriculum book lists. Check out link to the Newbery list and send me a comment with your favorite winner! I would like to send out a prize – my first ever on pineneedlesandpapertrails- to the reader with the most Newbery titles read, so shoot me a total (honor system).